Democratic 2020 U.S. presidential candidate Pete Buttigieg greets voters during a campaign stop at Portsmouth Gas Light, in Portsmouth, New Hampshire, March 8, 2019. FILE - South Bend Mayor Pete Buttigieg speaks to a crowd about his Presidential run during the Democratic monthly breakfast held at the Circle of Friends Community Center in Greenville, S.C. 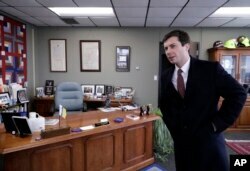 FILE - Mayor Pete Buttigieg talks with an AP reporter at his office in South Bend, Ind., Thursday, Jan. 10, 2019.